Recently refurbished modern 2 bedrooms apartment with private terrace, on the 4th floor without elevator. 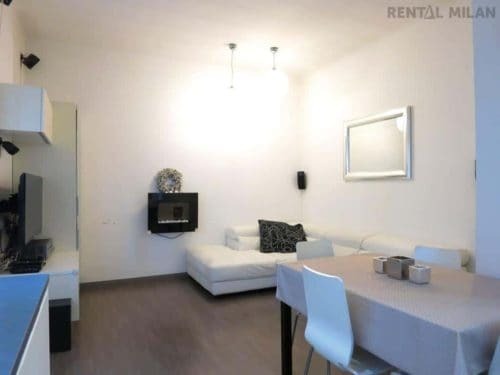 Living room with a comfortable white leather sofa, TV and a modern fully equipped kitchen with dish washer, microwave and electric oven, espresso machine. The main bedroom has a double bed and a very spacious wardrobe. the other bedroom has a bunk bed and a wardrobe. We could replace the bulk bed with a single bed and add a desk, on request… for free! The bathroom is very modern, there are 2 sinks, Jacuzzi, shower and window. The terrace has an interesting open view, quite unusual in the city of Milan! It has a cover verandah, you can enjoy even when it’s not summertime anymore! Dish washer, AC, high speed internet. The city center is 30 minutes by public transports. Convenient to reach IULM, NABA, Domus and Bocconi universities.